The powerful Leica Rechargeable Lithium-Ion Battery for Select Leica Digital Cameras has the capacity for about 575 exposures (as per CIPA test conditions) and only takes 200 minutes to charge in the Leica battery charger. It is for the Leica M8, M8.2, M9, M9-P and M Monochrom cameras. 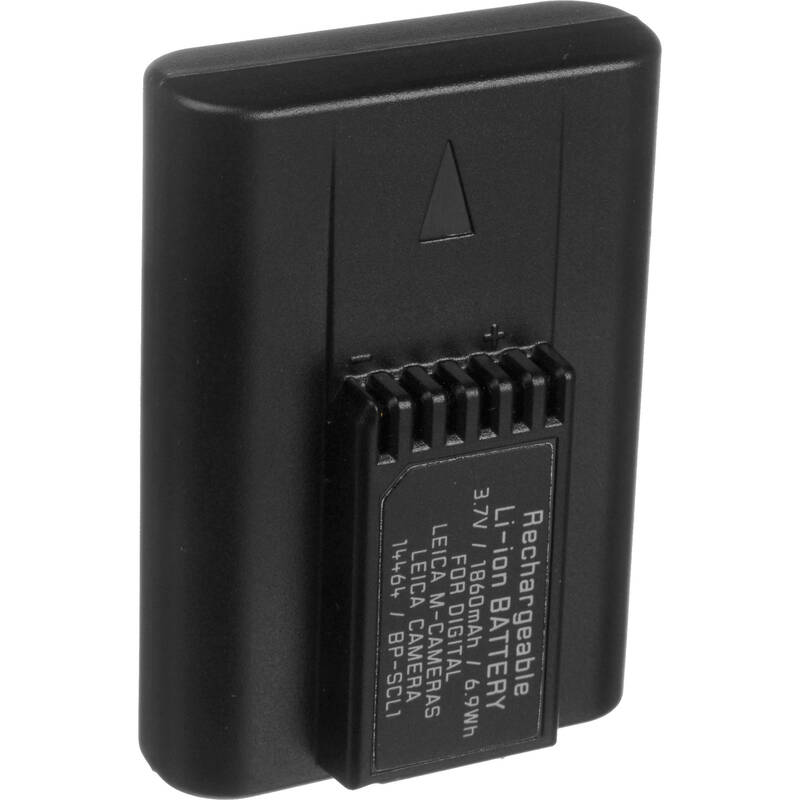 Box Dimensions (LxWxH) 3.4 x 3.4 x 0.7"
Rechargeable Lithium-Ion Battery for Select Leica Digital Cameras is rated 4.5 out of 5 by 72. Rated 4 out of 5 by jnor10 from Does The Job, 4 Stars for Price I bought this battery as a back up. As in all things Leica, it has a steeper price of admission than most other brands. I have no problem heading out for the day of shooting with a fully charged battery. I have been surprised in the past however after leaving my camera in the S position (Single Shot) and having not turned the camera off to find later that the battery has drained more than expected. This is with the menu selected for auto off after a minute. Not sure why that is? No other performance issues, the Leica M-E has a battery charge display, but you really need a spare as a backup. Rated 4 out of 5 by Michael from Excellent product - although pricey An excellent second battery for my M-9. A bit pricey, but there is no acceptable alternative. Many argue it's a small price to pay when someone can afford a Leica. Battery recharges quickly, and holds a charge for a long time. My previous Leica battery is still going strong after four years, although I recommend that everyone have a spare. Rated 5 out of 5 by Anonymous from Excellent Product - but too expensive I bought this as a back-up battery to the one supplied with the M8 since, particularly in the digital world, no battery = no pictures. I have only had to use it once on a trip at the end of a long day of shooting. It is an excellent product - like everything from Leica; but way too expensive. But it does what it is supposed to do very well. Rated 4 out of 5 by Herman Toothrot from Buy Two - You'll Need them I do a lot of event photography as well as day-in and day-out shooting. I've found that having three M8 batteries to switch between insures that I'm never without power. I must admit that I'm conservative when it comes to using third party batteries with high-end cameras. While there is definitely cost savings to be with them versus the Leica offering, there is piece of mind should the need for any repair of one's camera arise. Rated 1 out of 5 by AUbug from Total waste of money Bought the battery to replace another that went bad only to have this one go bad after only one use in my Leica M9. $ worth of trash. Rated 5 out of 5 by maralatho from Works fine. Wish they were cheaper. If you have a Leica M8 or M9, you'll need a few of these. Rated 5 out of 5 by Photomusicfreak from Leica M9 battery The Leica M9 camera goes with me everywhere. I shoot a great deal with it. Having a back up battery is just good sense. For example, what if I'm out and about and I encounter an especially great subject that I really want to get into, spending serious time shooting that. Obviously having that extra battery in your pocket enables you to keep getting those great shots.